Lisa’s books draw on her experience as a trial lawyer. 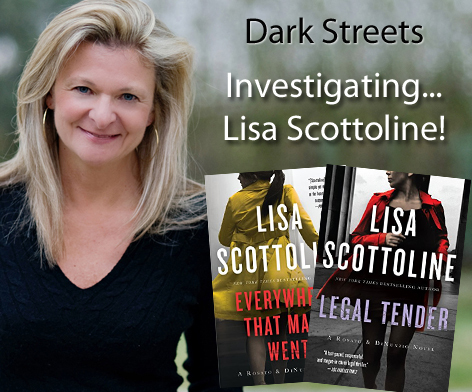 The Rosato & Associates series focuses on a prestigious Philadelphia law firm much like the one Lisa practiced in. Everywhere That Mary Went is the first — and best — example. Mary DiNunzio has been slaving away for the past eight years trying to make partner in her cutthroat Philadelphia law firm. She’s too busy to worry about the crank phone calls that she’s been getting — until they fall into a sinister pattern. The phone rings as soon as she gets to work, then as soon as she gets home. Mary can’t shake the sensation that someone is watching her, following her every move. The shadowboxing turns deadly when her worst fears are realized, and she has to fight for something a lot more important than partnership — her life. In Legal Tender, the second thrilling novel in the Rosato & Associates series, a successful lawyer now finds herself on the opposite side of the bench when she’s framed for murder. Benedetta “Bennie” Rosato is a maverick lawyer who prosecutes police misconduct and excessive-force cases, and business at her firm has never been better. Then, without warning, a savage murder tears the firm apart. All evidence points to Bennie, who has motive aplenty and an unconfirmable alibi. Her world turns upside down as the lawyer becomes the client and the cops she once prosecuted are now after her with a vengeance. To prove her innocence, Bennie probes deep into the murder. Then another killing takes place. Running for her life, Bennie is a fugitive armed only with her wits and courage. She will find the real killer—or die trying. My favorite is Lady Killer. Mary DiNunzio has become a big-time business-getter at Rosato & Associates. But the last person she expects to walk into her office one morning is Trish Gambone, her high-school rival. Back when Mary was becoming the straight-A president of the Latin Club and Most Likely to Achieve Sainthood, Trish was the head Mean Girl, who flunked religion and excelled at smoking in the bathroom. These days, however, Trish needs help. She is terrified of her live-in boyfriend, an abusive, gun-toting drug dealer for the South Philly mob. Mary remembers the guy from high school, too. She had a major crush on him. Then Trish vanishes, a dead body turns up in an alley, and Mary is plunged into a nightmare that threatens her job, her family, and even her life. She goes on a one-woman crusade to unmask the killer, and on the way finds new love in a very unexpected place. Who can’t relate to that????? I also enjoyed the 2017 entry in this series, THINK TWICE. Bennie Rosato’s twin sister, Alice Connolly, drugs her and leaves for dead, buried underground in a remote field. As Alice slips easily into Bennie’s life, doing her job, interacting with her friends, seducing her boyfriend, she never counts on the fact that Bennie is tougher than she seems. And that, against all odds, Bennie will escape. But escaping is only the first challenge. Alice’s sociopathic lies are so believable that she has everyone convinced that she is Bennie, and Bennie is her deranged twin sister Alice. As Bennie descends further into Alice’s life, she starts to feel the pull of evil herself. As the clock ticks and Alice gets closer to her ultimate goal, Bennie must face the shocking truth that she is perhaps more like Alice than she ever realized. This book so reminded me of the old Bette Davis movie, A Stolen Life! Lisa is the author of over 28 novels and over 30 million copies of her books are in print! She also writes “emotional thrillers” or “suburban crime” thrillers. The most recent of these is ONE PERFECT LIE. A handsome stranger moves to the small Pennsylvania town of Central Valley, and his name is Chris Brennan. He’s applying for a job as a teacher and varsity baseball coach at the local high school, and he looks perfect, on paper. But his name is an alias, his resume is false, and everything about him is a lie. And he has a secret plan – for which he needs a pawn on the baseball team. Heather Larkin is a struggling single mother who’s dedicated to her only son Jordan, the quiet rookie on the team. But Jordan’s shy and reserved nature renders him vulnerable to attention, including that of a new father-figure. There are so many of Lisa Scottoline’s books to choose from- put ‘em all on your Christmas wish list!!!!!!!! As you may or may not be aware, this is my last Dark Streets article. I have enjoyed writing these articles for you over the past few years. My passion has always been suspense and mysteries, cozies in particular. It’s what drove me to write the Nick and Nora mystery series, and the Cat Rescue series. It’s what also motivated me to do the new Pet Shop mysteries, coming soon from Midnight Ink. And others that are in the works! Even though I will no longer be writing here, you can still cat-ch me (and my cat ROCCO!) on our blog, www.catsbooksmorecats.blogspot.com We will still continue to interview authors and do mystery reviews there! I will also occasionally be doing articles there, just as I did here at Night Owl, spotlighting the very best in mystery and suspense! I sincerely hope that you will stop by! Once again, it’s been a pleasure! I’ll miss all of you.